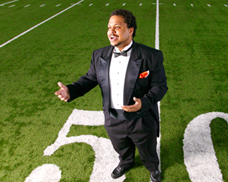 Kenneth Lowe chose singing over blocking to help pay his way through college. Kenneth Lowe was an all-league football player in high school who came to OSU as a walk-on, but quickly showed he was good enough to earn a scholarship–in music. Kenneth participated in football and track, as well as music, at Grant High School in Portland. When it was time to choose a college, he opted for music over football selecting OSU and turning down several small college football offers. Participating in the OSU choirs has broadened Kenneth’s life experiences. “I’ve been to Europe twice with the choirs, and to Canada and Mexico,” he says. “These are things I’d never have gotten to do otherwise.” Opera is still in his life as well, and he recently participated in a Corvallis production of Mozart’s Cosi Fan Tutte. At OSU, Kenneth works closely with Steven Zielke, director of choral studies, and Richard Poppino, director of vocal studies. He credits them with helping him through the transition to college and keeping him on the track toward graduation. Posted in OSU People and Programs, The Arts.